Either you stammer trying to come up with the simplest answer, or you’re hoping that whatever you usually say is the same thing your boss is saying in the opposite corner of the same conference hall. Fear not, the confusion is not a YOU problem, it’s a messaging problem, and a lot of companies have one today. Creating cohesive and effective messaging is one of the biggest challenges many companies face. When working with a client, one of the very first places we start is to take a look at their messaging. We’re looking for consistency. When done right, everyone in the company should be singing from the same hymnal on who the company is, what they do, and most importantly how their clients/customers benefit from using them (more on that last one in a moment). To address these pieces, we create one place where this all lives — a Core Messaging Document. This document then guides everything you do from a marketing perspective and serves as the foundation for all of your messaging. Everything you do moving forward will be anchored to this, so you want to make sure you take the proper approach. Right out of the gates this is where a whole lot of people fall down. This is where you should describe, in just a few sentences, the unique, tangible value people get from your product or service. Make sure it also passes the “so what” test – meaning it has to grab people and be interesting. Your unique value proposition should be benefits focused. However, many stray from the path here also: They can’t wait to tell you about all their features and solutions instead of telling you the benefits they provide. Here’s the reason features make for less effective value propositions than actual benefits: features center around your experience. But savvy marketers know a seller-centric playbook no longer works to build deeply engaged customers. By centering around your customers and structuring both your unique value proposition and key benefits to speak directly to what they are experiencing, you quickly address customer pain points, and can then create an effective framework to build the rest of your messaging on. IS IT A FEATURE OF BENEFIT? This is a feature because it’s about the way your product functions, not the value it provides. Here we have zoomed out to think about the big picture and what your customers stand to gain by working with you. Since you’ll likely have too many benefits to wrap directly into a unique value proposition, often it will make sense to outline key benefits below the value proposition with a sentence that supports each of them and how they resolve a potential customer’s pain point. The elevator pitch is your 30-second response to the “what do you do?” question and should fall directly out of the value proposition and benefits you outlined in the step above. Again, make sure you focus heavily on the benefits here – why should the customer take time to care what you do? But remember, this isn’t a sales pitch. It’s just a conversation with someone, theoretically in an elevator. Once they show they care about more, then you can get into the details. There are lots of ways to build your elevator pitch. You can start with a question or offer up an example of success with a quick case study example. Regardless of how you approach it, the elevator pitch can’t be dry and full of jargon and complicated concepts. Answer the questions “What do you do?” and “What makes it unique?” Do it layman’s terms with words everyone understands. There are lots of examples out there including these from Hubspot, but the key is to be creative and succinct. This is the short 2-3 sentence description of who you are and what you do, and again falls right out of the value proposition. You find the boilerplate copy most frequently in press releases or short online directory submissions. While this might seem dry and like busy work I’m giving you here, I promise it’s not. Here’s the kicker on having boilerplate language: Companies that don’t have clearly defined explanations of who they are create internal chaos and external mistrust. Draft a boilerplate company description that is under 100 words and clearly communicates your value. And then make sure that everyone in your company has it. It should also include a call to action at the end that points readers to your website or maybe your social channels. 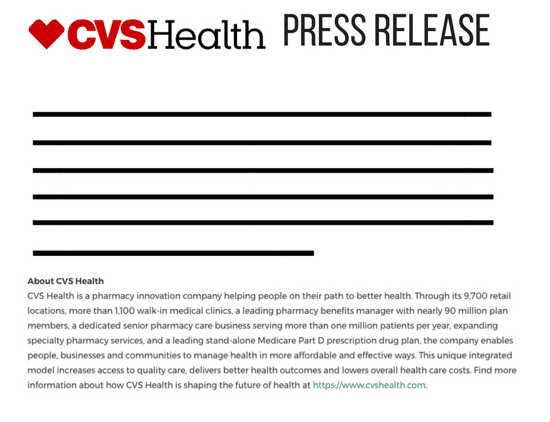 Here you can see how CVS outlines who they are, what they do, and what sets them apart, all while centering the value they provide their customers. If you’re still fuzzy on how to get all of these elements nailed in a way that truly describes who you are, get some inspiration with these seven stellar boilerplate examples. This part will likely be the largest part of your document, but don’t let that scare you. 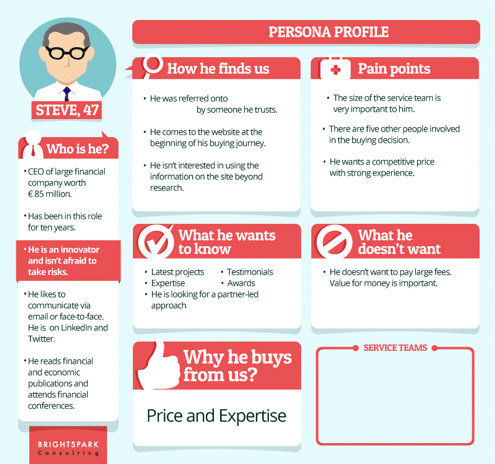 In this section, start by thinking about who actually purchases your product, and listing out each of the buyer roles (i.e. marketing), and representative titles (i.e. VP Marketing, CMO, Marketing Director). Remember to make sure that you have talked to customers, researched buyers, and have a bank of information on who purchases and uses your solution to create messaging that resonates with them. Completing an exercise like this will help you keep your responses to your buyers’ pain points laser focused and relevant. To nail this section of your core messaging document, create three columns, one for Buyer Goals/Objectives, one for Buyer Potential Pains and one for Impact of Pains on Goals. Continue this until you have completed it for all your different buyer personas and you’ll understand how to address all your audiences. A useful exercise to dig into how you are different from your competitors is to go back to those awesome benefits you outlined in step 1 — your unique value proposition and key benefits. How does each of those benefits compare to what your direct competition offers? Are they similar? Do you offer something totally different? By really wrapping your head around the value you provide over your competition, you can hone in on what content to write, and what aspects of your business to focus on, and how to direct your marketing strategy to effectively set yourself apart from the competition, all thanks to your expertly crafted core messaging document. With a solid messaging guide containing these five key components, you are now ready to move forward and tackle anything that comes your way, from a networking event to marketing campaign. Focusing on these five areas will help you craft messaging that can guide your content creation strategy and campaign planning for quarters to come. If all of this seems a little bit overwhelming, or you just want us to check your work, we’re happy to help. Editor’s Note: This post was originally published in May 2010 and has been thoroughly updated for comprehension and accuracy. The post The 5 Key Components of a Core Messaging Document appeared first on Right Source Marketing.